A modern dining table is not just the centre of your kitchen, it’s the centre of all home life. It’s where meals are eaten, homework is done, games are played, and countless catch-ups are had over tea and biscuits. Making sure you chose the right table for your home is a big decision, as often a dining table will be a part of your home for many years. Such an important piece of furniture deserves a little limelight; read on for some inspiration on the best table for you. Bold interiors are very on trend right now; we’re seeing plenty of dark colours and metallic accents. If this is your style, then you’re sure to love our metal edged table. The table’s base is a contemporary X-frame, and the top features a symmetrical geometric pattern. The burnt oak paired with the contrasting brass edging and exposed bolts makes this table a showstopper, ideal for any industrial style space. Similar to the brass-edged table, is our 'Sheffield' X-frame Table with elm top. The X-frame base is available in four striking colours, taking this modern dining table to a new level. Choose from silver, brass, copper, or natural steel. The tops available are red elm, brown elm, rustic aged elm, or limed elm. Go for a combination that suits your interior, and your needs. 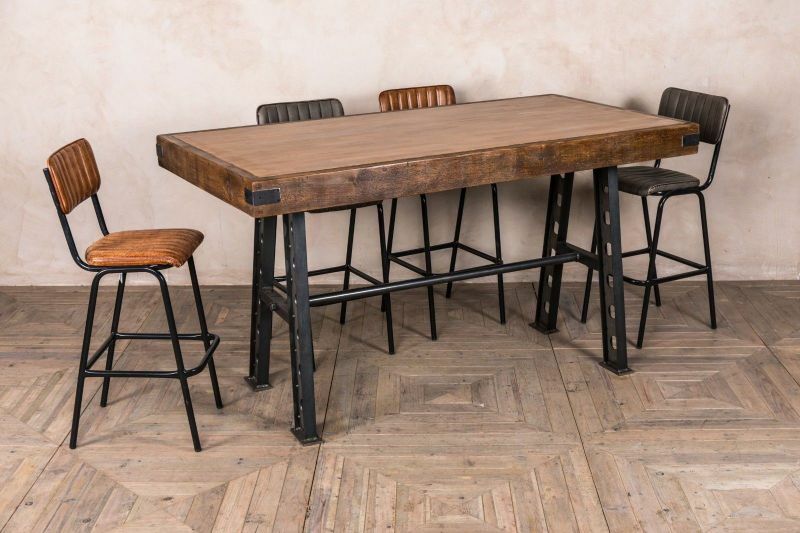 (We can even do this table with a brass, copper, or zinc top!) This table is quite large so is best suited to large kitchens or dining rooms, and it is sure to be a standout feature! 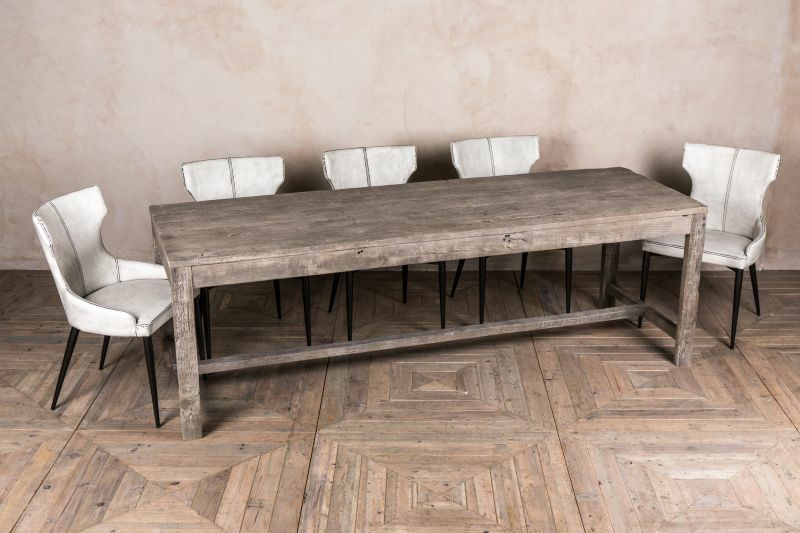 For a more simple, rustic interior, the ‘Wilkins’ table is minimalist but still packs a big style punch! 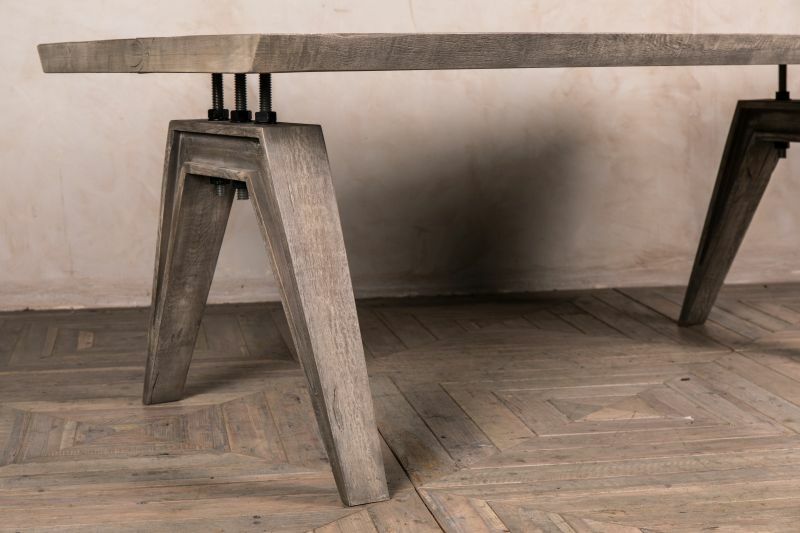 Rustic charm meets contemporary design in this table, and it even has a little surprise up its sleeve. Outwardly, this chunky oak table has a calm pebble grey colouring that would suit a rustic or neutral space. Look closer, and you can see that the top and frame are connected with three large threaded bolts on either side, giving the ‘Wilkins’ a secret industrial quirk. 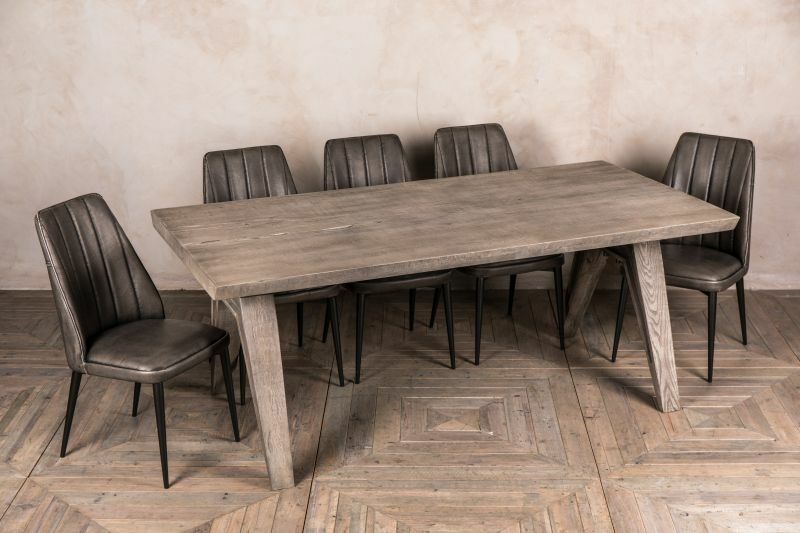 Place this modern dining table in an industrial style interior and pair it with leather seats for a stunning look. 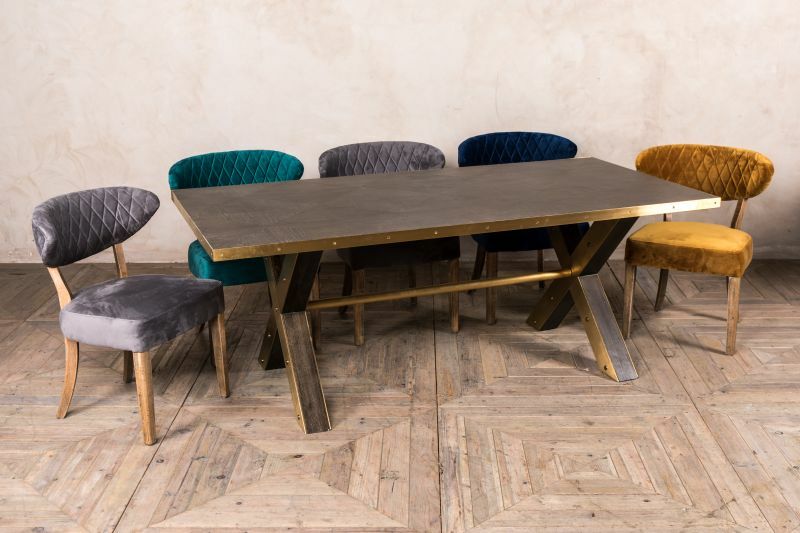 If you’re after a more traditional dining table but with a modern twist, then the ‘Miller’ table might just be for you. Its sturdy design and pebble grey colour is ideal for a variety of interiors. This table is oak and has a stripped back appearance; natural knots and marks to the wood give the ‘Miller’ fantastic charm and character. If you don’t know what you want, or you’re after something completely different, why not have a browse of our Design Your Own Table range? We have hundreds of top and base combinations to choose from to create the table of your dreams! Simply select your favourite base and peruse the top options available for that base – it really is that easy. We now have brand new concrete effect and butcher's block table tops. Pictured above is a 'Zeppelin' laser-cut poseur base, paired with a butcher's block top. We’re always more than happy to help should you need some advice when creating the perfect modern dining table, just give us a call! The heart of the home is at the table. 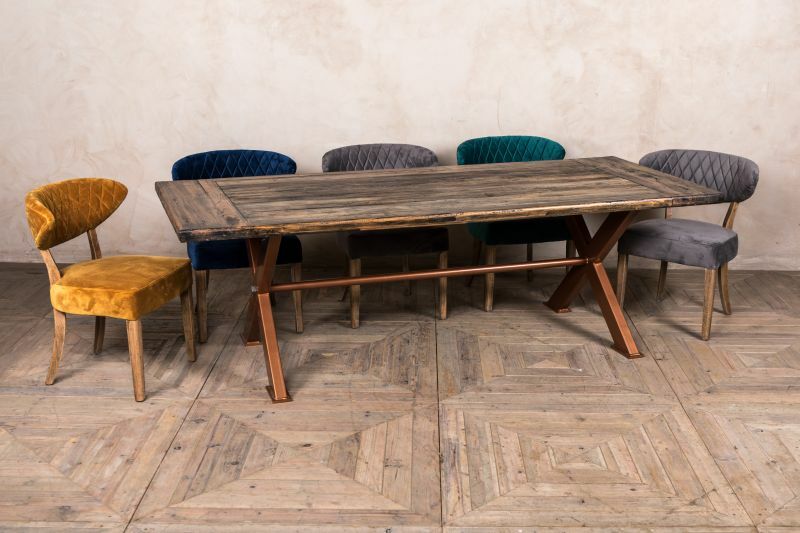 Take a look at our vintage and modern dining tables to find one that’s right for you.